Complaining is a bad habit that can get in the way of a healthy team and culture. When negative thoughts are flowing, your team can easily become disengaged, and their work will suffer. However, if this habit has crept its way among your team, there are things you, as a leader, can do to get rid of it. The first thing you need to do is locate where the issue is coming from, like if there is a specific employee or team. These things typically have a source, so if you start there first, you can address it more effectively. 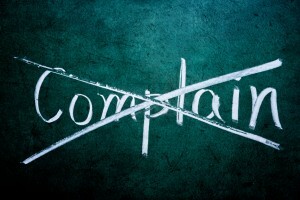 Learn everything you can about the issue that has caused the complaining and negativity. If it’s about compensation, learn if it’s specifically benefits, salary or bonuses. If it’s about office life, figure out if it’s conflict between teammates or culture clashes. Again, you cannot address problems if you don’t know anything about them. After you learn everything you can about the source and reasoning behind the negativity, it’s time for you to take action. Whether you can make a change or even just acknowledge the issue to your employees, you should be able to temper the negativity. But remember, you cannot make everybody happy, but doing your best will still help the situation. Lastly, keep the door open for future communication. If something happens down the road, make sure your team knows they can talk to you about it. Sometimes those who complain just want somebody to listen to them. Be there for these people, so long as it’s productive for your team. You can definitely draw the line at significant other problems! Have additional advice? Leave us a comment! This entry was posted in Clients and tagged cut complaining, no complaining at work, stop complaining. Bookmark the permalink.